As the number of dead and stranded seals washing up on southern Maine beaches rises by the day, researchers are linking the sudden die-off to decades of chemical pollution that made the seal population vulnerable to toxins and disease. “We don’t think there is any possibility that these animals are biologically healthy,” said Susan Shaw, a marine biologist based in Blue Hill. Shaw has studied the effect of man-made toxins such as polychlorinated biphenyl – PCB – on the long-term health of harbor seals for almost two decades. Her findings, based on flesh samples, show that the population of harbor seals in the Gulf of Maine is loaded down with toxic, immune-suppressing chemicals, conclusions that are in line with a thick body of scientific evidence from studies of whales, dolphins, porpoises and other marine animals in the U.S., Canada and Europe. “They have body burdens that are just staggering,” Shaw said. The ongoing seal die-off has nearly overwhelmed Marine Mammals of Maine, the Harpswell-based nonprofit that manages a network of volunteers who respond to reports of stranded animals on the southern Maine coast. The volunteers assess which seals are so sick or weak they have to be taken to the group’s rehab facility in Harpswell or to an alternative clinic outside the state. In the past week, volunteers responded to 100 dead seals on Maine beaches south of Portland and in Casco Bay, said Lynda Doughty, the group’s executive director. The phone has been ringing off the hook, and on Friday afternoon volunteers were clearing a backlog of animal reports. Marine animal rehabilitation clinics across the Northeast stopped taking stranded live seals last week, concerned that healthy animals in recovery could be exposed to whatever is causing the die-off. Volunteers had to euthanize at least three suffering seals in the last few days, Doughty said. There is no obvious reason for so many animals suddenly dying or becoming ill. Dead seals have been found in various stages of decomposition and across all age groups. The state reports clear water quality readings and the dead animals don’t seem malnourished, Doughty said. 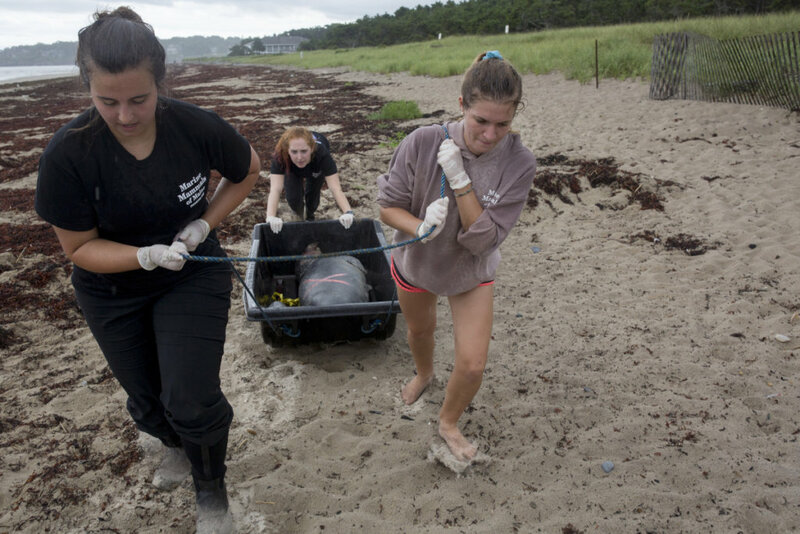 On Saturday afternoon, Marine Mammals interns Katie Gilbert, Kat King and Laura Cassetty strained as they dragged a dead 5-foot harbor seal in a plastic sled less than 100 yards across the beach at Scarborough Beach State Park. The animal was destined for the group’s Harpswell base for testing. The team was assigned to Scarborough to collect the big seal, but while there, they also investigated a newly reported smaller seal washed up in seaweed clumps on the northern edge of the beach. Interns measured the little seal’s fins and checked its mouth and body for signs of trauma. Both carcasses were mostly intact, but vacant eye sockets showed signs of predation by opportunistic scavengers. The smaller seal was left for park staff to dispose of. Greg Wilfret, the state park manager, stood by to transport the dead animal with a tractor. In his 46 years working on the beach, Wilfret has gotten used to getting reports of dead or stranded seal pups, but this year is different. And some are big adults, at least 300 pounds in one case, he said. Spring and summer are typically high times for seal mortality because it is when young pups are trying to survive on their own, adults are molting and seals are more likely to get hit by boats. But the volume of dead and stranded seals this summer is unsettling, Doughty said. Excluding Saturday’s toll, since the beginning of the year, 414 dead and stranded seals, the vast majority harbor seals, have been reported in Maine, more than twice the annual average in the last seven years, according to the National Oceanic and Atmospheric Administration. Rescuers reported 179 dead seals in Maine since the beginning of July and another 51 dead in New Hampshire, according to the agency. So far in August, 114 dead seals have been reported just in Maine, according to NOAA’s data. The 10-year average for the entire month of August in Maine is 38 dead or stranded seals. A working group is determining if the die-off is an “unusual mortality event,” said agency spokeswoman Jennifer Goebel. The designation would authorize a federal investigation into the causes of the event and may help repay animal rescue groups for their costs via a donor-supported contingency fund. Tissue samples from seal carcasses and oral swabs from live seals are being tested at state, federal and private laboratories for pathology, infectious diseases and harmful algae blooms, Goebel said. Doughty, from Marine Mammals of Maine, said NOAA is testing for influenza and distemper, two maladies known to affect the population. Results are not expected until at least this week at the earliest. While the sudden die-off has shocked volunteers and the public, the effect on the overall harbor seal population is unclear. Harbor seals are some of the most common marine mammals in the U.S., and while legally protected from hunting, they are not endangered or threatened. The harbor seals commonly seen in Maine are part of a population that lives in coastal waters from the Bay of Fundy in Nova Scotia to New York and New Jersey. There are approximately 76,000 harbor seals in the western North Atlantic and the population had not significantly changed since the last survey in 2012, NOAA reported in its 2017 stock assessment. The number of gray seals believed to be in U.S. waters is much lower, around 23,160, according to NOAA’s most recent stock assessment, but scientists believe the population is growing. While the seal population seems robust, Shaw’s research indicates an underlying vulnerability from generations of man-made toxins. Shaw, the founder of the Shaw Institute – formally the Marine and Environmental Research Institute – has been studying toxins in seals and other marine animals since 2000. A high level of exposure to PCBs among harbor seal pups was one of her first findings. Years of research have aligned with Shaw’s findings, said Milton Levin, a professor at the University of Connecticut who studies the effect of pollutants and toxins on marine animals. “The weight of evidence suggests that animals that are exposed to different environmental contaminants, somehow that modulates their immune system, (and) that may make them more susceptible to viral or bacterial diseases,” Levin said. Before production was banned in the U.S. in 1979, PCBs were widely used in insulation, adhesive, paint, plastics and electrical equipment. The compounds cause serious health effects in animals, including on the immune, reproductive, nervous and endocrine systems and are a probable carcinogen in humans. Despite the ban, widespread PCB contamination is present in marine food chains because the durable chemical takes so long to break down in a natural environment and work its way up the food chain into large predators like whales and seals, Shaw said. Her most recent work showed that adult, juvenile and young harbor seals along the Northeast coast had an average PCB contamination of 76 parts per million – almost six times the level at which the chemical suppresses an adult animal’s immune system. Since PCBs are hard to metabolize, the contamination passes down through generations of seals, Shaw added. That’s why adult females often have lower levels of contamination than adult males or pups – because mothers have offloaded some of the chemicals onto their offspring. Other toxic, long-lasting chemicals such as polybrominated diphenyl ethers – PBDEs, a commonly used flame retardant in household furniture and electronics – are also found in marine animals and have similar effects to PCBs, but have not been found in anywhere near the same concentrations, Shaw said. “We are talking about food web toxicity – are the oceans sustaining these top predators?” Shaw said.